Some of you may know I am an avid genealogist, I have 28 yahoo groups at last count & have documentation for most of my family line going back to the Chiefs of this nation, the Mayflower & the Kings & Queens of Europe & the Middle East, even a few Far Eastern lines. My Jewish line alone goes back 10,000 years, as well as the DNA of that line. I was trying to take my mind off of my troubles & picked a line at random to research. Tonight it was a grandfather from the Souix nation, I just realized some things, one of my grandfathers was the first Native who ever won the right in court to be recognized as a human being, you heard me right, he fought to be recognized as a human being. It was a victory that could not have ever been conceived of in that day & age. Some 30 yrs ago before I knew of my family, in my quest for religion, I was trained by a Lakota Medicine man, he would tell me I was Standing Bear returned back to his people, um… Okay, but I had a bunch of kids with allergies & needed to know the roots, herbs & medicines here to help them. I tolerated his constant rantings about it, & learned what I could from this kind beautiful man. I finally got my mark & it was a Mandan with a Bear Paw with 2 Eagle Feathers in the center, I was disappointed because my spirit animal was the Wolf & the Thunderbird. Somehow I thought I had failed to attain all that I should but his time was not long enough for this world to teach me everything. A few years after he died I was looking at a book by E.S. Curtis, I opened up the book randomly & there was a picture of a man with my face. It was Chief Standing Bear! I kid you not, so now I knew why the Medicine Man would say I was him, that I had come back to fight for my people, the resemblance was uncanny. Imagine the shock & amazement when I found that he was in fact one of my Grandfathers!!! Around the same time I discovered my Jewish, Russian & Aleut cultures… Maybe “discover” is not the right word, it was something I lived, the way I was raised, the values I was taught but they never had a name because it was NOT new wavy gravy super cool to be an Indian or Native when I was a kid, as a matter of fact it could get you killed, & it would most certainly get you beaten daily. So you just didn’t talk about it, you never gave it a “name” & you stayed alive. There was no “Native Pride” there was only shame & fear. It took Grandfather almost a 100 yrs to be recognized for his accomplishments. Not only did he win the right to be called a Human Being, but he won the decision under the “Color of Law” statute as well or “Color of Authority as it was known as back then. “First. 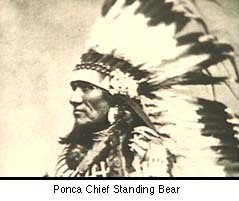 That an Indian is a person with the meaning of the laws of the United States, and has therefore the right to sue out a writ of habeas corpus in a federal court and before a federal judge, in all cases where he may be confined, or in custody under color of authority of the United States, or where he is restrained of liberty in violation of the constitution or laws of the United States. Second. That General George Cook, the respondent, being the commander of the military department of the Platte, has the custody of the relators [the Poncas] under color of authority of the United States, and in violation of the laws thereof. Third. That no rightful authority exists for removing by force any of the relators to the Indian Territory, as the respondent has been directed to do. So do I believe I am the reincarnated version of my Grandfather? No, but I do know I come from Warriors, that my people before me have fought harder battles & won. They laid the groundwork for me to succeed, they fought the battles from before, for me already. Now I know I can not give up, I can not give in. I also now know that I can win. « Good Bye Norma Jean… You are still missed.